So the last post was one Korea’s body shapes/lines and, like I said, this one will be about Korea’s face shapes/lines! In alphabetical order here we go! The EGG LINE: This is from a front view of a face and describes an egg shaped face. An oval or rounder face shape has apparently been becoming more desirable in the past few years more than the triangular V-line shape. Both vying for dominance here! Yoona from SNSD is known to have the ‘perfect egg-line’. 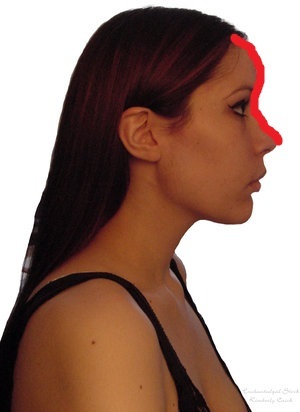 The S LINE: From a profile view (side view) this is a line that is drawn from the top of the forehead down the bridge of the nose to the tip. If this results in an S shape, the face is in good proportion. The V LINE: This is the shape of the jaw and chin and is the most popular Korean face line known overseas. A pointed chin swooping straight back in a V shape to the ears. Jenna Marbles is a good example of the V line and you’ll see many KPOP idols getting photo-shopped to achieve the V shape. Surgery is also available to achieve this specific look as well such as jaw shaving and chin and cheek bone reduction. The 1/8 LINE: In Korean, 8 Deung-shin. This line describes a face so small it only accounts for 1/8 of the body. Whether this is attractive or not is not clear however, it is known that Korea tends to find small faces attractive. So yep, Korean face shapes/lines! Again not everyone in Korea will know of all of these but this list contains all the ones known so far. BOOM!